Kathrine Schlageck is the senior educator at the Marianna Kistler Beach Museum of Art. 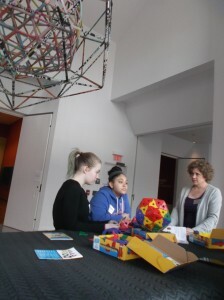 Platonic solids and the Kansas Meatball – its an Icosahedron! Middle school girls from around the state of Kansas spent February 21st on the K-State campus as part of the GROW “Jammin’ with the Arts” workshop. 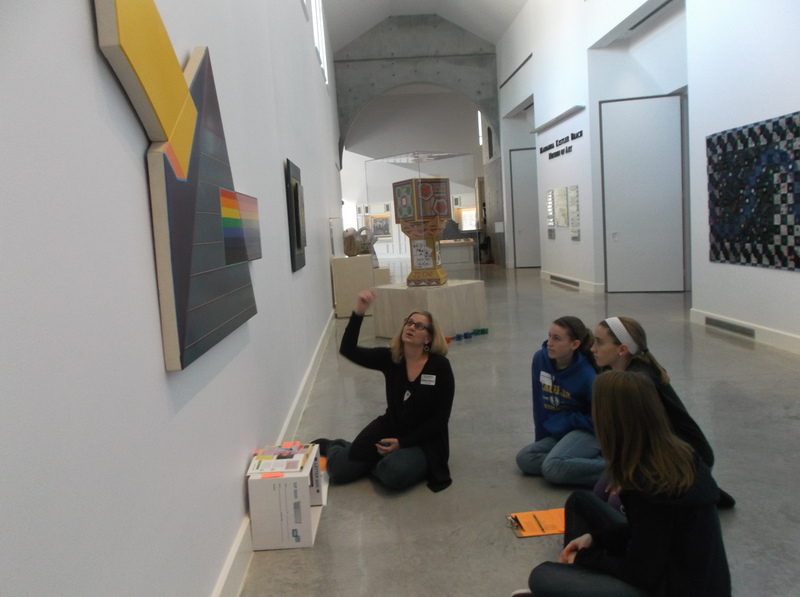 One of their stops was the Beach Museum of Art where they went on an Art, Math and Science Amazing Race. Activities included learning about color and light waves, dot matrix printing and optics, thinking about the mathematical origins of the Kansas Meatball and Pyrro Techniko, and trying different media and thinking about the chemical compound used to bind pigments into useable paint or pastel. Trying oil and chalk pastels. 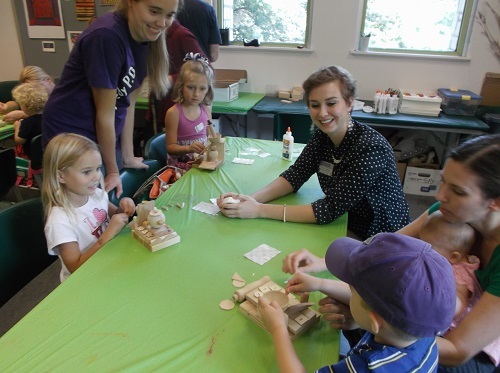 Young visitors to the Beach Museum of Art this fall will enjoy two special exhibitions featuring wood sculptures. Tours and programs are focusing on developing observational skills and tie to the newly released Kansas Career and College Readiness Science Standards. “Tree of Life: The Art of Charles Bello” and “Life Forms: Chet Peters” provide opportunities to examine the physical properties of wood such as color and texture, and familiar shapes such as dancers and flames can be interpreted by using Museum Movement Technique. ARTSmart classes had a chance to practice problem solving skills as they created their own 3-D wood sculptures. 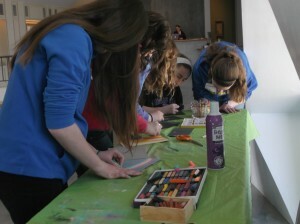 School groups will have a chance to take a closer look at color and texture as they create mini-exhibitions. 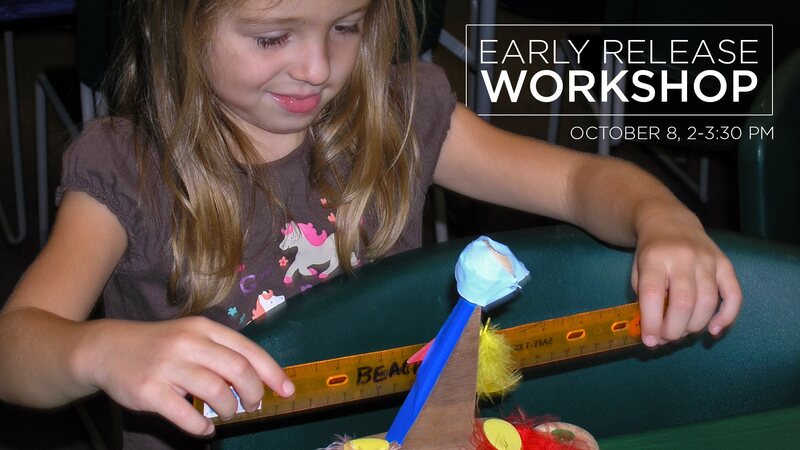 An early release workshop is scheduled for October 8 from 2-3:30 p.m. with a cost of $5 per participant,$3 for Friends of the Beach Museum of Art members. 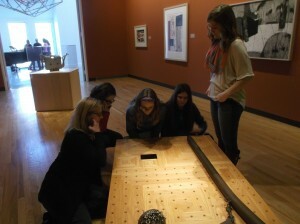 Free Fine Art of Observation Tours are still available for school groups. Please contact senior educator Kathrine Schlageck at klwalk@ksu.edu for more information. Examining small Chet Peters wood sculptures. Photo courtesy Kathrine Schlageck. October is Blindness and Visual Impairment Awareness Month and the Beach Museum of Art is offering visitors a chance to smell, hear, taste, and feel some of the art on display in the galleries from 1:30 to 3 p.m. on October 5th, 2014. 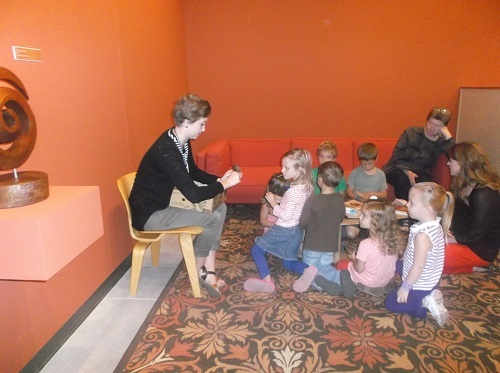 The tour begins with the Sensory Station in the exhibition “Igniting the Senses” where activities include listening to bird songs, feeling snake skins, smelling flowers, and tasting a still life. October 5 is the final day for this interactive exhibition developed in conjunction with the Manhattan Public Library Summer Reading Program. Gallery teachers will assist participants in two special exhibitions by artists Charles Bello and Chet Peters, both wood sculptors. There will be small touchable sculptures by Chet Peters and raised diagrams of the Charles Bello sculptures. Visitors may request visual description of the sculptures and there is an educational exhibition on redwood trees that may be touched. We invited everyone to come to this event. It’s a great chance to use all your senses to experience the featured exhibitions.